Richly flavored using red wine and a variety of spices. 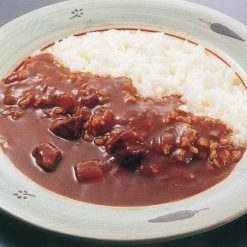 This Japanese-style curry is richly flavored using red wine and a variety of spices, and contains 11% meat. To prepare the curry, place it (still frozen, still in its bag) in an ample quantity of boiling water. Cook for 10 to 12 minutes. If the bag touches the rim of the pot, or if the bag is sticking out or hanging out of the pot, the bag can melt and develop holes. Please boil with care. Will be very hot after cooking. Please use caution to avoid burns. 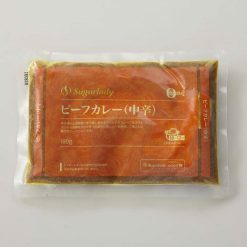 This product contains beef, vegetables (onions, ginger, garlic), wheat flour, pig fat, sugar, vegetable/fruit paste (tomatoes, apples), curry powder, flavoring extract (beef, yeast), table salt, red wine, fermented milk drink, enzymatically hydrolyzed wheat gluten, spices, caramel colorants, (contains soybeans and gelatin).. This product is not suitable for anyone with allergies to milk, wheat, beef, soy, pork, apple or gelatin. Origin of ingredients: beef (Australia). Prepared and packaged in Japan.